If only vidka didn't make me crazy...last time I was found in the neighbours hedge looking for 'oliphants'! I will try this receipt for sure. Thanks for sharing! Have a fantastic weekend. Happy Saturday Sharefest! It sounds so refreshing, but I'm having a hard time understanding how the basil lends itself to the concoction. Wouldn't fresh mint be better? See...I can't even spell it! gosh that actually looks so refreshing! You can stop right there. No more needed. Its like strawberry lemonade with a twist! I love the color it turns too. I never would have thought of basil in a drink! This combination sounds heavenly!!! If it wasn't grey and overcast here, I'd be supping these on the patio. As it is, I'll make do inside! I'm meeting some friends today for a picnic. I'm making of batch of these to take. Thanks. I have but one word for you: YUM. Yummy!!! I definitely will mix one up. Sounds yummy. Plenty of hot days still here. Yum! And I have nothing else to do tonight!! Ooooh sounds amazing - but my head is hurty today from last night so think I'll wait till I'm all better then give it another go! You read my mind - I actually tried one of these out near the beginning of the week and it was AMAZING. I was real iffy about the basil being too strong, but it was a nice compliment to the tartness of the fruit. YUM! Good call!! Okay...it's 7 am where I am, where would I have to be for happy hour? JK...I can't drink a lot of hard liquor without food...but this looks too irrestible! This must "nourish you" you should sign up for my amazing meal giveaway by answering "what nourishes you"
Boy, I could really go for one of these! It's supposed to be over 100 degrees in the coming days. Love the basil! That not only sounds good, the color is beautiful! I am about to go down to the coast and will definitely be making these. Thanks for the recipe! Oh, and I'm following you.... you are DANG FUNNY! That combination sounds so yummy. I'll have to give this a try. Wow, that looks delish! Basil, would not have even thought to try basil with it, but this looks very refreshing! Thanks for stopping by my blog and giving some design advice :) Cheers! This sounds A-MAZING! And I love any drink that involves Vodka and fruit. oh GOD!!! it looks DELICIOUS and DIVINE!!! i am ready for a pitcher of this! well, not quite yet at 9am, but SOOOOOOOOOOOOOOOOOOON. must get the fixings!!! Whenever vodka is in the title post - I'm there! Haha. Sounds great! Making my mouth water...is noon too early for one?? Love your blog! Thanks for the sweet comment! that sounds so good! I'll take your word for it being just as good w/out the vodka. Not a minor, but prefer them virgin myself. gotta get some strawberries! There's an award for you over at my Rantings. I don't drink vodka but I bet this would be delicious without it. I would substitute some club soda, I think. How pretty. Strawberries and basil are actually an excellent combination. HOpe you have a wonderful weekend! 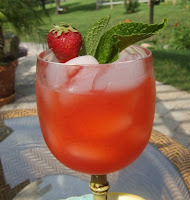 Hi Jen, Thanks for your sweet comment on my blog, cocktail sounds great, I have just started growing basil, so perfect! You start a recipe with "1 BOTTLE of vodka"?? You're my hero. (And apologies for being so slack with the comments this week. Life is stupidly busy, and I had a bit of a technology break to try and cope with it all. Will be back in business next week! Love you, gorgeous lady). Oh my that sounds and looks delicious I believe I will have to try this one. Thank you for stopping by today I appreciate it. I saw you on the blog hop too from yesterday. Thanks for the yummy tipsy tip! Cheers! ooooh I copied that for my next 'girls night in' extravaganza. Damn I don't drink but this sounds like it could surely tip me over. The cocktail and the bloggy thing sounds fun. 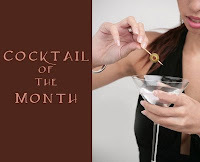 This drink is going to our girls night out of town party in a couple of weeks. Stopping by from the Blog Hop. oohhhh that drink looks darling!! i'll just have to settle for my water! LOOKS LIKE MY NEW DRINK OF THE MONTH yummy!! Stopping by from bloghop09...that cocktail looks delish! Love your blog design--simplistic and elegant! oooh, this is perfect for me becuase I love vodka, grow my own basil, and did I mention that I love vodka?? I think I might have to try that. Blog hopping... thanks for stopping by! I am so going to try it. I love berries and I love vodka, so I am loving this before I even tried it. Stopping by on the BlogHop. Nice to meet you! I've drank Vodka lemonade but not one with a strawberry twist, sounds and looks yummy. Basil? Really? Hmmmmmm...I never would've thought of that. Sounds pretty dang good though. Hey! It's nice to meet you! This sounds SO yummy, I am going to try it out next weekend! I'm giving away a $5 gc and a few more prizes on my blog here if you'd like to stop by today! mmmmm that sounds absolutely yummy! So, I DID end up making this while we were at the beach and it was sooooooooooooo yummy! Thanks for the great recipe!